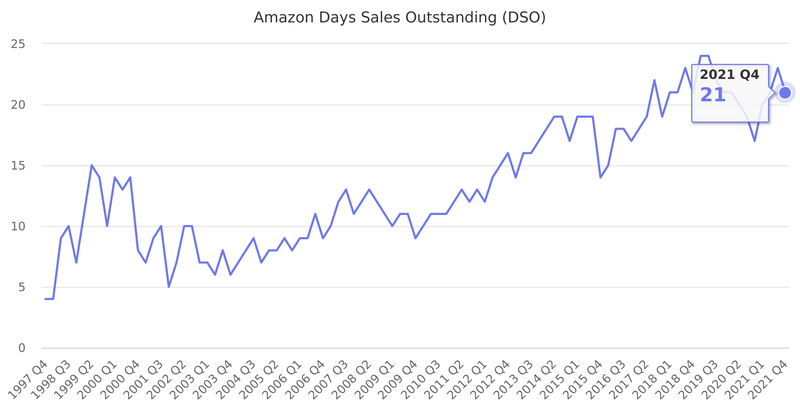 Days Sales Outstanding (DSO) is a standard accounting metric, defined as a measure of the average number of days that a company takes to collect revenue after a sale has been made. A low DSO value means that it takes a company fewer days to collect its accounts receivable. The formula to calculate DSO is written as: accounts receivable / total sales * number of days. This is caculated based on Accounts Receivable and Net Sales figures reported by Amazon. Last reported quarter 2018 Q3 it was 23.00, up by 4% year-over-year from 22.02.